When two simple sentences are joined together using and or but you should put a comma before and or but. 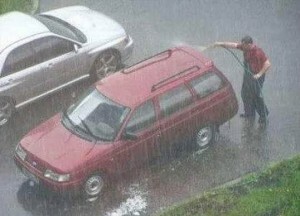 I am trying to clean my car, but I don’t have any soap. When two simples sentences are joined together using a conjunction (for, and, nor, but, or, yet, so), it should have a comma before it. • I have spoken to Sarah, and she has confirmed the dates. • I have spoken to Sarah. + She has confirmed the dates. • I wanted to go to the beach but couldn’t afford to pay for a hotel room. There shouldn’t be a comma before but because couldn’t afford to pay for the hotel room is not a complete sentence. In the following sentence there should be a comma before but because I couldn’t afford to pay for a hotel room is a complete sentence. • I wanted to go to the beach, but I couldn’t afford to pay for a hotel room. Remember: A comma when you join two sentences. The bear wants to play with his friends, but they can’t see him.